The Nest is an intervention that intrigues and invites. 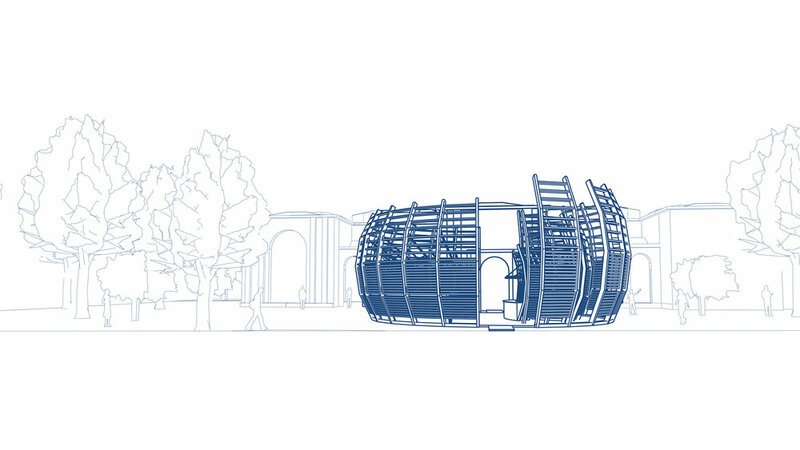 The desires of Dulwich gallery is to create new inventive ways of looking at art, furthering the exploration through this proposal provides an understanding of how art could be discovered through the weaving of the natural environments ecosystem and space. Our intervention is progressed from a linear journey to a halved cluster of concentric circles placed alongside the pathway towards the main entrance of the gallery. This approach invites visitors to move swiftly towards the entrance of the gallery or to purposely explore the alternative pathways offered by the intervention. As we researched the palimpsests that form and inform the layers of structures, The Nest developed and took shape from influences such as habitational responses towards birds’ nests and the different formulations of fungi. This inspired us to consider that the concept of layers, and their addition in the Dulwich gardens, can create an exciting moment, adding to the overall experience of the sequence of spaces present at the picture gallery. The Nest aims to encourage visitors to consciously meander, providing the option to look between the corridors with the exhibited art pieces on the right, or enjoy the space of the amphitheatre on the left, all the while maintaining a visual link with the gallery from any point in the pavilion, due to the gaps in between the horizontal beams of the modular structure.